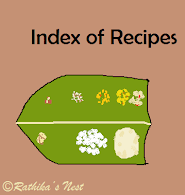 Traditional Brahmin menu incorporates raw vegetables and greens in the form of pachadi (பச்சடி) and kosumalli (கோசுமல்லி). Pahadi or raitha is a curd based preparation that goes well with spicy items in the menu. Ginger pachadi has a unique flavor and it tastes just great with sambar rice. This is a traditional recipe and very easy to make. Check out the recipe. Method: Wash the coriander leaves well in running water and chop them finely. Beat the curds; add salt to beaten curds and mix well. Grind coconut, coriander leaves and ginger with little water into a fine paste. Add the paste to the curds and mix well. Heat oil in a tadka pan/ spice pan (தாளிக்கிற கரண்டி), add mustard seeds and when they start to sputter, switch off the fire. Add the seasoning to the pachadi. This pachadi can be served as an accompaniment to sambar rice or part of the feast menu.